Throughout the past few months we have accomplished a lot here at Link Ethiopia, none of which would have been possible without your continuing support. Following is an overview of our latest projects. For access to our annual report, please click here. Our collaboration with the Days for Girls project is up and running: we have delivered 225 re-usable menstrual hygiene kits to girls at our link schools. We are very pleased about this project partnership as it helps prevent girls from dropping out of school during their period. We have ensured that each girl receiving a kit also attends a training session to help them gain an understanding about puberty, menstrual hygiene and sexual health. June, a facilitator from Days for Girls UK, visited Gondar last autumn to train our staff and 10 female secondary school teachers to ensure they then have the skills to teach the girls accordingly. We have been working hard to set up a Furniture Fund which raises money to buy beds for families who don’t have them. Many families lack proper bedding and sleep either on straw matresses or benches made out of mud and hay. A donation of £200 provides a bed to a family. This includes the frame, mattress, sheets, blankets and pillows, and you can buy bedding for your sponsored family or another family in urgent need. We have also set up an ongoing fund for those who do not wish to buy a whole bed. To buy a bed, click here, and include the message ‘bed’ when you donate. If you want to contribute without funding an entire bed click here and include the message ‘furniture’. Do you know someone who might like to sponsor a child? We have a waiting list of 12 children who are in need of urgent support. 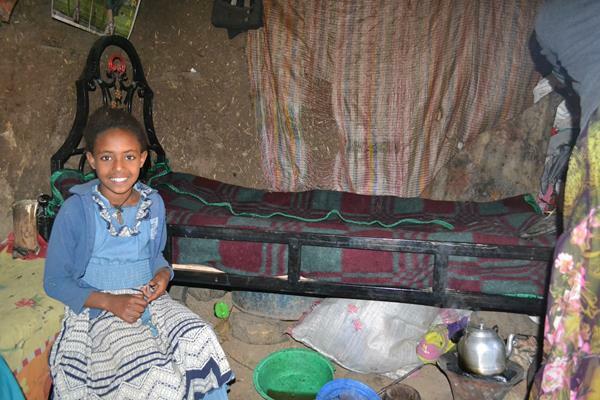 Birhan (right), is a twelve year old girl who lives in Gondar. She has four siblings and her parents sometimes struggle to support their children as Birhan’s mother is often unwell. Food, clothing, sanitary and educational materials are in short supply. 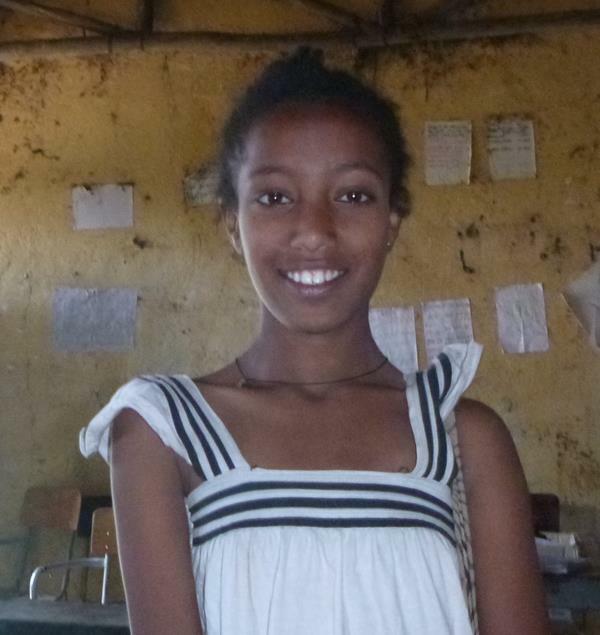 It takes Birhan one hour to walk to school, and although this means she is sometimes late, she never misses a day of school. She has an ambitious educational drive and wants to be a teacher when she grows up; she is ranked 7th out of 33 students in her class. Thanks for supporting the Christmas Campaign! Thank you for supporting our Christmas Campaign, funding two new classrooms at Andinet Primary school; we raised over £3,500 including a very generous donation from the Third Ripon Girl Guides group, who will be visiting the school this summer. As you can see in the photo (left), the classrooms are already completed and the school is now waiting for their new desks, chairs and blackboards to be delivered. The extra classrooms will allow the school to offer grade 5 next year, meaning that the current grade 4 students can stay at their village school instead of having to add hours of walking to their school day to continue their education or drop out altogehter: education will be much closer to home. Our Christmas campaign was supported by our partners Aid Camps International, who were able to fund half the classroom block. AidCamps organise volunteering trips that give something back to the communities they visit. Our second AidCamps group journeyed out to visit Gondar in February, combining a trip to the Simien mountains with camping at Andinet and assisting with the building work. Our tours are a fantastic way to see Ethiopia for the first time. We now have tours scheduled which take in the awesome historical North of the country or the beautiful Rift Valley in the South. The Southern tour will take place in August 2018 and the Northern tour will take place in October/November 2018. In addition, this year we are adding a special tour for those who would like to see the more active side of Ethiopia. Along with our sister charity the Kindu Trust, we will be holding a 10k run to raise awareness about girls’ education through Gondar on Sunday 11th November. This tour will also include the famous Great Ethiopian Run in Addis Ababa on Sunday the 18th November. We have places for the Royal Parks Half Marathon this year in October: so why not sign up and start training over the summer? Ten runners are already running for Link Ethiopia and we have guaranteed spaces for another 10 – of any ability. We have had sun every day for the past few years of this run and are looking forward to another fantastic run through some of London’s most beautiful spots this 2018. Challenge yourself and join us! Previous PostTour Ethiopia this Year!